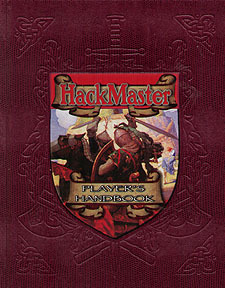 The HackMaster Player's Handbook expands upon Basic with new races, classes, skills, talents and advancement opportunities to 20th level. A solid tome with really lovely production values takes the concepts laid out in the basic version and expands on it with more character races, gnomes half elves half orcs and half hobgoblins as well as the murderous surface dwelling fallen elves the Grel, More character classes Ranger, Rogue, Barbarian more in game religions for clerics expanded sections on gear spells a couple of advanced fighter options Knight & Paladin. Rules on character advancement up to level 20 expanded magic rule more Talents for all classes including class & character race specific ones & probably much more but I have not delved into this trove enough to find it yet.